With over 100 cookbooks on my shelf, it’s easy for some to go unopened for a while. Our busy schedules keep us from being as creative with our meals as we would like. So the cookbooks languish with disuse and our meals tend to start repeating with ever-increasing frequency. Does this sound familiar, or am I the only food blogger that gets into occasional food ruts? To avoid a rut, I opened two cookbooks recently that have sat forlornly on my shelf for a while—Great Good Food and Fresh Start, both by Julee Rosso of The Silver Palate fame. Very appropriate considering I’m in another watch-what-I-eat swing. Baby #3 arrives in early September, and I’ll be in my third trimester during the hot summers months. Knowing my luck, it will turn out to be the hottest summer on record! And since school will be out, I’ll have a toddler and a preschooler running around all day. Then when baby #3 arrives, I’ll have three little boys under the age of four to chase after. Time to find more light, healthy, quick, and easy meals to fix. Of course the doesn’t mean that I won’t have an occasional devil-made-me-do-it meal or dessert, I’m just trying to keep our meals simple and healthy for the coming months. I spent a couple hours reviewing some of my favorites from the two books. Great Good Food has over 70 Post-It flags for recipes that I like or want to try and Fresh Start comes in a close second. Probably my favorite recipe from GGF is not even for a meal, but for an ingredient. 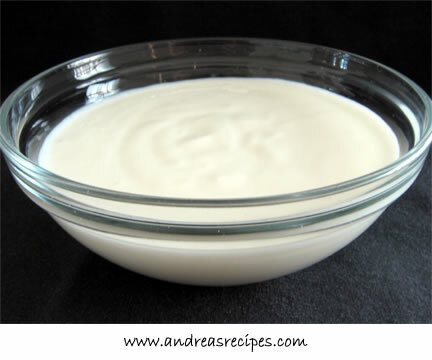 Rosso’s Low-Fat Blend makes a great substitute for sour cream, heavy cream, or mayonnaise, and you can even make it non-fat. I find it very convenient because I always have the two required ingredients on hand—cottage cheese and yogurt. I use it in our Garlic Mashed Potatoes and Sugar-Topped Coffee Cake instead of sour cream, and they taste delicious. Pour the cottage cheese and the yogurt into the blender and put on the lid. Blend on low to medium speeds until the mixture looks smooth and creamy. Pour into the 16 ounce container and store in the refrigerator. Better still, use Greek Yogurt! Its full fat version contains about 10g of fat, but there are low-fat and non-fat yogurts available (there is even one made with sheep/goats milk). The best known brand in Europe is FAGE Total Greek Yogurt and I think they are also known in the States. I use it extensively in recipes that ask for sour cream. I haven’t found any in my local grocery stores, but I imagine if I went to one of the Greek or Mediterranean delis in the area I might be able to find it. Thanks for the tip!